Serlachius Museum Gösta Competition – Serlachius Fine Art Foundation Gustaf Museum, R. Erik Serlachiuksen katu 2, Mänttä, Finland. Installation „Desire for Identity“ at the German pavilion at the 12th Architecture Biennale in Venice by the chair for design methodology and representation Prof. Mark Mückenheim Technical University Munich, department of architecture. Mark Mückenheim, Juliane Demel, Harry Dobrzanski, Peter Schmid and Maren Weitz. Participating students: Benedikt Bührle, Dorian Cani, Tatiana Galitzine, Franziska Gehrmann, Manuel Gemoll, Maximilian Kimmel, Bertram Landwehrlin, Daniel Lechner, Bin Lin, Victoria Lippsmeier, Astrid Neukirch, Doris Stranninger, Robert Strasser, Irina Vorontrova, Ran Xu. Exhibition „small-scale models in architecture“ at the Maison De L‘Architecture in Lille, France (House for Architecture Lille) curated by Celine Saraiva (www.mav-npdc.com) (February – April 2010). Exhibition of student and research results of the chair for architectural design methodology and representation Prof. Mark Mueckenheim, Immatrikulationhall at the TU-Munich (Feb. 2010). BDA travelling exhibititon „New New“ University of Cottbus, Germany (March-May 2009). BDA travelling exhibititon „New New“ German Architecture Center – DAZ, Berlin (Jan.-Feb. 2009). 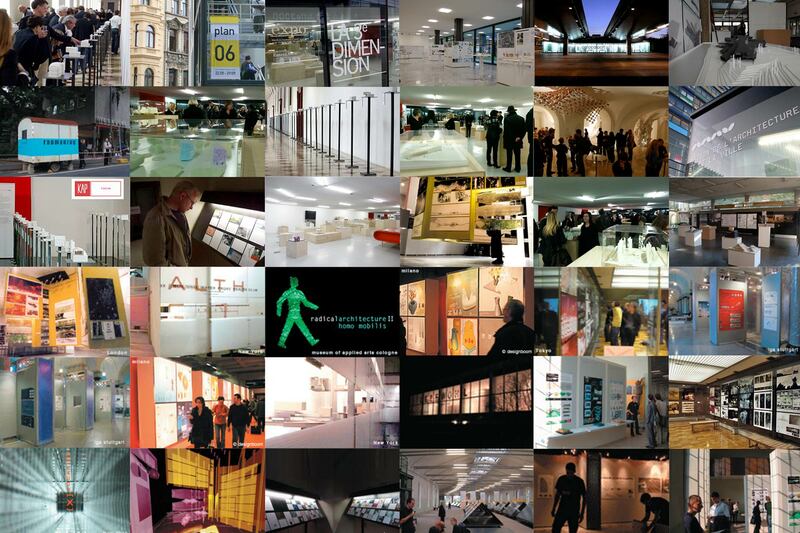 BDA travelling exhibititon „New New“ German Architecture Center – DAZ, Berlin (November / December). BDA travelling exhibititon „New New“ in der Residence Munich (June). Design Biennale Riga – Exhibition of student projects of the chair of building science and architectural design – RWTH Aachen in Riga, Latvia (September – October). Competition results “Skatepark Dresden”, city hall Dresden (August). Competition results “Erweiterung der Kunsthalle Bremen”, at the Kunsthall Bremen (August). Competition results 2nd phase “Landmarke Lausitzer Seenplatte”, Lausitz (April). MACEF spring salon, finalists of the MACEF Design Award – international design fair, Milan, Italy. (January-February). “urban farming” – Exhibition of experimental architecture at the University of Tokyo (January-March). Competition results BUGA Schwerin, city hall Schwerin (April). „Laborprobe“ Weisslack – architecture book store, Dresden (July). Competition results „Jacob und Wilhelm Grimm – Zentrum” Senate headquaters for urban development, Berlin (September). “Unit 20” Exhibition of the Bartlett Unit 20 at Valencia School of Architecture Spain (September). Competition results “urban island” Northern Osaka Station Area chuo-koukaido hall – Osaka, Japan (March). Competition results “Grand Egyptian Museum” Competition Building – Cairo, Egypt (August). “Lebe Wohl” Exhibition at Economy-Club Hannover-Langenhagen, Germany (September-December). “Lebe Wohl” Exhibition at state trade headquaters, Stuttgart (June – July). “Lebe Wohl” Exhibition at the house of commerce, Stuttgart (September-December). „Raumanzug / Spacesuit – Urban Hubris”, Exhibition of a postcard project by „Club A“ at Plan02 international architecture fair and symposium, Cologne (September). UIA Berlin, Exhibition of student projects of the BU Wuppertal in integrated architectural design at the UIA Berlin (January). “Radical Architecture II” Exhibition of experimental Architecture at the Museum of Applied Arts Cologne (September). “urban farming” Bartfest 2001 – Exhibition at the Bartlett School of Architecture London, England (June). “Space-X” Exhibition at Aronson Gallery, New York (April). Exhibition for the NAAB – Acreditation of the architecture department at Parsons School of Design, New York (project: “the horizontal façade“) (February). “the colours of Pollock” (4 ink on mylar drawings) Exhibition at the 26E. 13th Street Gallery New York. (April). “Highrises in Düsseldorf” (2 architecture mixed media renderings of the Studyhouse by Bernhard Pfau) exhibition at the Kunsthall Düsseldorf (October). “Hommage à Bernhard Pfau” (2 architecture mixed media renderings of the Studyhouse by Bernhard Pfau, ink, pencil, colored pencil and chalk) exhibition at the Studyhouse Düsseldorf (May-June).